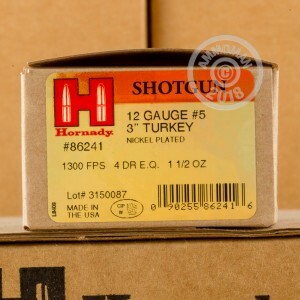 Turkey hunters will appreciate the accuracy and power of Hornady Heavy Magnum 12 gauge shotshells. These shells come in boxes of 10 and fire a 1-1/2 oz. load of #5 birdshot at a muzzle velocity of 1,300 feet per second. 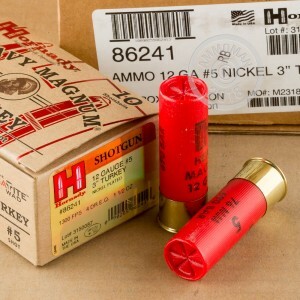 This ammunition features the Hornady Versatite wad, which is designed to render turkey chokes unnecessary. It performs well with an improved cylinder or modified choke and delivers lethal patterns at 50 yards and beyond. The Versatite wad strips cleanly from the shot column and helps shorten the shot string for maximum impact. 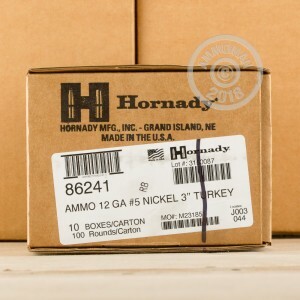 Hornady ammunition is loaded in Grand Island, Nebraska.